A tether strap is an adjustable webbing strap found secured to the top back of your child's car seat shell with a metal hook attached. Some cars will require an extent ion strap so the tether can reach the bolt (these come in 300mm and 600mm lengths). The purpose of the top tether strap is to reduce head excursion, that is, "the distance the child's head moves during an impact". Information on tether bolts can be found here. Top tethers can be found on both rear and forward facing seats. Some seats do not come with a top tether at all. This movement places greater pressure onto your child's neck and spine during an accident. Injuries from this kind of force could result in long term disability and in some cases it is fatal as the spinal cord may stretch, tear or detach from the spine. Australian car seat tethers must be used at all times and always pass to the rear of the the car in both rear and forward facing mode. The Australian standard is AS/NZS 1754 "5 Ticks". Seats meeting American Standard FMVS 213(will also display the yellow NZ "S" mark), do not use the top tether when rear facing, with the exception of the Radian XTSL and Diono RXT, which allow Swedish tethering towards the front of the vehicle using a "D" loop. This differs from the tethering system found on the Brio Zento (UK Standard) sold in New Zealand. If your seat meets European standard (UK ECE44.03) it may not have a top tether. It is important that you follow the installation method correctly as they tend to require a full lap & sash seat belt for a correct install. Some seats with the European standard allow Swedish tethering when rear facing. Typically the tether strap passes towards the rear of the vehicle and attaches to a tether bolt (not to be mistaken with a cargo clip found in the floor bay of a station wagon or larger vehicle). The bolt should be situated in line with the car seat, not off to one side, and can be located on the boot sill, the car roof, the back of the vehicle seat, or the parcel tray of a sedan. Bolts may be pre-installed, covered under a plastic covering, or need to be manually screwed into the car chassis, or a hole may need to be drilled for the bolt to be fitted. 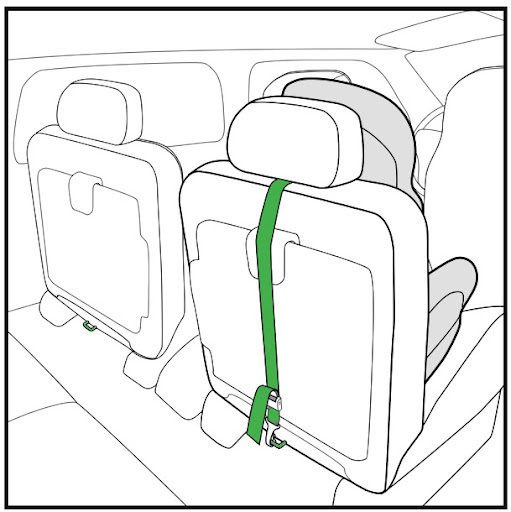 The tether strap should be pulled taut when the seat is in use, but should not alter the angle of the car seat when installed. Australian car seat tether straps must pass over the seat and clip on to a tether bolt at the back of the car. This means the seat has a webbing strap either side of the seat when installed and the seat belt will pass through the seat under the child's legs. Australian seats cannot be installed using LATCH. To get the child out of the seat you can release the strap, bringing the child out over the top of the strap or underneath the strap. Always check that the strap is done up before driving. Swedish tethering allows a seat to be tethered rear facing with the straps towards the front of the car. Currently the only seats in New Zealand that allow this are the Brio Zento and the Radian XTSL. Swedish tethering cannot be used with any other car seat currently sold in New Zealand. Doing so may jeopardize the safety of the child traveling in the car seat. The Brio Zento provides a set of 2 straps that wrap around and feed through seat in front of where the car set is installed, then clips onto the car seat shell. One strap is placed either side of the seat. The Radian XTSL (now Diono RXT) has a small webbing with metal attachment known as a "D-ring" that attaches to the front seat leg, and the tether strap clips onto the attachment on the D-ring. 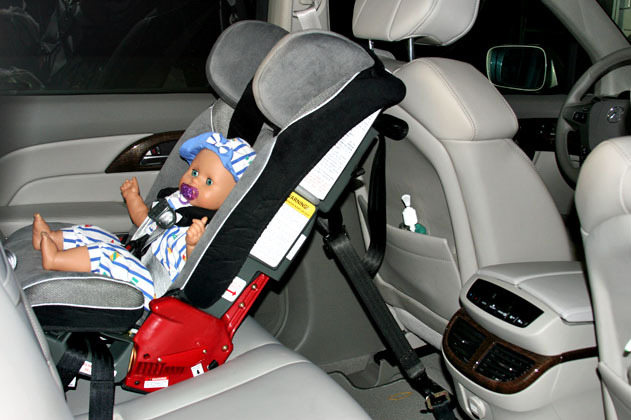 Car seats with a fitted tether strap must be used when forward facing. The strap passes to the back of the car, behind the car seat. It must be pulled taut so there is no slack. The seat belt passes through the back of the child's car seat. The same applies to car seats that convert to booster seats, or sole booster seats that come with a top tether strap fitted. The seat belt will rest over the car seat and across the child's body. Do not over tighten the top tehter strap. It should be tight, but not over tight so to alter your install. The seat should not move more than 2.5cm (1 inch) in any direction once installed. | Why wont my seat install correctly? Help!